A crowd numbering around 100 people gathered outside the Athlone Civic Centre on Tuesday afternoon (August 23 ) in protest against the lack of action on flood protection for rural areas. The protest coincided with an Office of Public Works public consultation on the Draft CFRAM Report. The gathering consisted of concerned farmers and residents of rural areas, representatives from the Irish Farmers’ Association (IFA ), and local councillors including Fine Gael’s John Dolan and Tom Farrell. People travelled from places near and far, including Roscommon, Offaly, Longford, Clare and Leitrim, to express their dissatisfaction with the report. 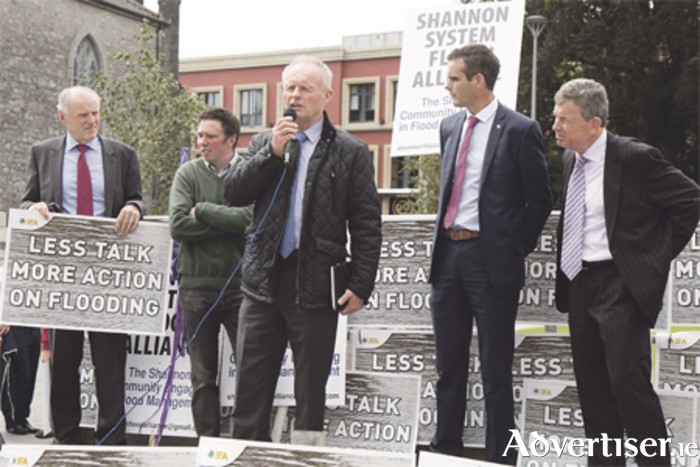 Guest speakers at the protest included IFA Flood Project Team chair, Padraic Joyce, and IFA president, Joe Healy. President Joe Healy told the listening crowd that farmers are “very angry” that no work has yet proceeded to avoid the recurrence of the severe floods of last winter. He said last winter’s floods had “a devastating impact” on the livelihoods of thousands of farmers and on rural dwellers who remain fearful that the situation will be repeated again this winter because no action has been taken to prevent it. Mr Healy criticised the CFRAM report, saying it ignores rural areas and farmland, and where works are proposed the environmental concerns are overriding the public good. He called on the Government to initiate works “no matter who gets in their way”, in reference to the environmental agencies objecting to certain measures being taken on the river. IFA Flood Project Team chair, Padraic Joyce, said there is still stagnant water on farms affected by the last flooding event and criticised the fact that there has been no maintenance of the Shannon since then. Mr Joyce said he has spoken with Minister of State with special responsibility for flooding, Sean Canney, and with local Deputy, Kevin ‘Boxer’ Moran, on the issue. He said both men showed a genuine interest in solving this problem. He expressed his and the IFA’s willingness to work alongside Deputies Canney and Moran to achieve some sort of resolution for farmers utterly “fed up” with inaction. Echoing the point made by Mr Healy in relation to environment, he told the listening crowd it was time the Government put “people and property before flowers and fauna”. Public submissions on the Draft CFRAM Report will be accepted until September 23. Rio – Mayo – Tralee and more besides!